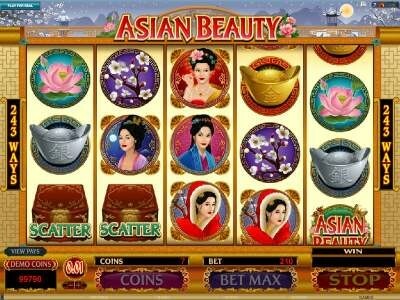 Asian Beauty is a far eastern themed video slot by one of the top and leading software developers in the industry, Microgaming. This is why players will be able to find this game and enjoy it with real money bets at any Microgaming casino such as Jackpot City casino, Royal Vegas Casino and others. Since the game is themed around Asians beauties, players will see plenty of Asian females on the reels of the game as well as other Asian inspired symbols on the reels and in the overall design and layout of the game. The game has 5 spinning reels and it offers players 0 lines as it offers them something better, 243 ways to win. This gives players more chances of winning than the standard line setup. The game has a bonus round which is called the Mirror Bonus Round. This round is triggered randomly by the game. It offers players a great chance to win huge money rewards. The logo of Asian Beauty is the wild card that the game has, it can replace any symbol with the exception of scatter or bonus symbols.